Nearly two decades ago, a small Paraguayan NGO teamed up with a global environmental NGO and a mid-sized American energy provider to save a chunk of rainforest from the sawmills by offsetting greenhouse gas emissions. The Ecosystem Marketplace revisits one of the world’s first carbon offset projects: the Mbaracayú Forest Nature Reserve. Second in a three-part series. Nearly two decades ago, a small Paraguayan NGO teamed up with a global environmental NGO and a mid-sized American energy provider to save a chunk of rainforest from the sawmills by offsetting greenhouse gas emissions. The Ecosystem Marketplace revisits one of the world’s first carbon offset projects: the Mbaracayº Forest Nature Reserve. Second in a three-part series. 8 January 2008 | Six years before the Kyoto Protocol was drawn up, North American energy provider Applied Energy Services (AES) paid $2 million to offset roughly 47 million tons of CO2 by helping to fund the Mbaracay Forest Nature Reserve (MFNS) in Paraguay. It was 1991, and the debate over forestry credits was foggy to say the least. Indeed, few outside of a tiny circle of forward-thinking academics and activists had truly pondered how to quantify the amount of carbon captured in trees, let alone how to measure the impact of sustainable forestry on indigenous people. MFNS organizers, however, managed to create a 64,000 hectare private reserve, the benefits of which flow out to a 300,000-hectare buffer zone of sustainable agriculture. The indigenous Ach people have taken an active role in managing the reserve, and smaller private reserves are sprouting like mushrooms in the buffer zone to create migration corridors in support of a UNESCO-recognized biosphere reserve. The Mbaracay region is one of last remnants of the traditional Ach hunting ground, over which they’d been losing control for decades before finally being dispatched to reservations in the 1970s. Mbaracay then passed to an Argentinean logging group called FINAP, and finally ended up in the hands of the World Bank after FINAP defaulted on a loan. North American anthropologist Kim Hill then began lobbying the World Bank to give the land to the Ach, but it remained in limbo for years, and by 1987 seemed destined to be divided up and auctioned off to soybean farmers for $7 million. That’s when Hill teamed up with Raul Gauto, who was heading the Paraguayan Ministry of Agriculture’s Conservation Data Center and working with The Nature Conservancy (TNC) to build a biodiversity data base. Gauto and Hill asked TNC for advice on turning the area into a forest reserve with special use rights for the, and Gauto quickly carried out a comprehensive biodiversity survey of the property to help them make their case. But they continued to pursue other routes. 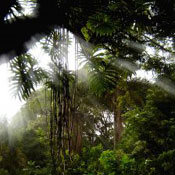 Gauto had heard about AES after the company funded a pioneering forestry project in Guatemala. Through TNC, he was able to get word of the situation in Mbaracayº to AES owner Roger Sant. At the same time, he persuaded twelve Paraguayan businessmen to create a non-profit organization called Fundacion Moises Bertoni (FMB) to lobby the government on behalf of the Ach. These efforts yielded fruit after the fall of notorious Paraguayan strongman Alfredo Strssner in 1989, and the Paraguayan government passed a law making the reserve possible and promising land near the reserve would be transferred to the Ach, in accordance with a 1989 United Nations convention on the rights of indigenous people. The World Bank, however, continued to balk at donating the land. But they did lower their price to $5 million, at which point FMB offered $2 million and was given the property – on the condition that it would not be grabbed by the government and that indigenous people would play an active role in managing it. The two NGOs quickly secured donations to cover the purchase price, with a smattering of miscellaneous small donors (including members of the rock band REM) chipping in a total of $250,000. AES and USAID contributed $500,000 each, and one very generous anonymous nature lover from Ohio came up with $750,000. That trust fund is where the bulk of the carbon offsets come in. As the deal was coming together, AES was looking to offset 35 years of emissions from a new power plant it was building in Hawaii. The company calculated that the plant would emit 13.1 million metric tons of carbon over the ensuing 35 years—or about 47 million tons of CO2 using the generally accepted conversion factor of 3.6:1. They offered to pay just over 15 cents for each ton of carbon sequestered—or about 4 cents per ton of CO2, roughly $2 million in total, with $500,000 going to the purchase of the land, and $1.5 million establishing the trust fund used to maintain the property. Getting the money, however, required not only measuring the amount of carbon in the trees, but proving to AES that the forest would not survive without the funding—what today we call the “additionality” requirement. Gauto tapped the forestry faculty of the National University and the staff of the National Forest Service to measure the amount of carbon sequestered in the trees. The study involved first identifying three different types of forest using satellite imagery, and then measuring the diameter of all trees thicker than ten centimeters at chest height in fifteen plots within these three forest types, and then extrapolating the total carbon in each tree based on that data. Then they assigned a biomass per hectare amount for each forest type, and used the satellite images to come up with a total number. Although the reserve is obligated to send yearly reports to AES, FMB has not commissioned another carbon inventory since the project launched. “The 64,000 hectares are intact, so we know the amount has not gone down,” says Speranza – adding that another inventory is in the works. “At first, we only had 57,700 hectares,” says Speranza. “The other 6,000 hectares came over the next few years – but 57,700 is still a lot of territory to protect from danger.” FMB found that illegal logging had been taking place around the edges of the reserve, and went about recruiting and training forest rangers. Four private reserves have already been created, and FMB hopes to see between 80,000 and 100,000 hectares of the buffer zone eventually covered in reserves. In 2001, the United Nations Educational, Scientific and Cultural Organization (UNESCO) recognized the surrounding area as the Bosque Mbaracay Biosphere Reserve, which has made it possible for FMB to secure more funding from grants. The group has also promoted sustainable agriculture within the buffer zone, and introduced crops such as sesame into the area. Speranza says he can document a quadrupling of income over the past five years, and believes much of this flows from FMB’s social efforts—which include the funding of schools and a health center, as well as communications infrastructure. Speranza says that the trust fund has given FMB a chance to prove its financial competence, and three years ago became the first NGO in Paraguay to receive a grant directly from the World Bank’s Global Environmental Facility. They’ve since leveraged their good reputation to secure loans and grants to get into for-profit green businesses. They recently identified a similar meat packing plant in Chile, and together with a Chilean partner formed a joint venture to purchase and manage the property in a sustainable way. As shareholders, FMB receives dividends from the partnership. Controversially, FMB recently agreed to a ten-year strategic alliance with soybean growers interested in developing a management model also based in a triple bottom line. Speranza says the project creates both social and environmental value because FMB is helping neighboring communities create private reserves inside their properties, but he fears some will accuse him of making a pact with the devil. The law establishing the reserve gave the Ach exclusive rights to hunt on the reserve, and they also have seats on the reserve’s advisory board, but Hill says they’re still being short-changed. And that’s hardly a minor issue. One of the key selling points of avoided deforestation projects is that they will help indigenous people and small landowners—in part by forcing more clarity on land tenure. Critics say that clarity may come at the expense of the indigenous people such projects purport to help. These issues are sure to gain prominence in the year ahead as we explore the efficacy of the new Climate, Culture, and Biodiversity (CCB) standards—the success of which will largely hinge on their resolution. Next in this series: we revisit a late 1990s project in Brazil, the Guaraqueaba Climate Action Project, and examine the impact of standardized methodologies on projects in the works today. Steve Zwick is a regular contributor to the Ecosystem Marketplace. He may be reached at steve.zwick@gmail.com.